A shrub or bush is distinguished from a tree by its multiple stems and shorter height, usually under 5–6 m (15–20 ft) tall. A large number of plants may become either shrubs or trees, depending on the growing conditions they experience. Small, low shrubs such as lavender, periwinkle and thyme are often termed subshrubs. An area of cultivated shrubs in a park or garden is known as a shrubbery. When clipped as topiary, shrubs generally have dense foliage and many small leafy branches growing close together. Many shrubs respond well to renewal pruning, in which hard cutting back to a 'stool' results in long new stems known as "canes". 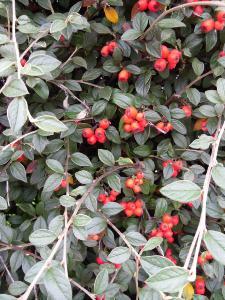 Other shrubs respond better to selective pruning to reveal their structure and character. Shrubs in common garden practice are generally broad-leaved plants, though some smaller conifers such as Mountain Pine and Common Juniper are also shrubby in structure. 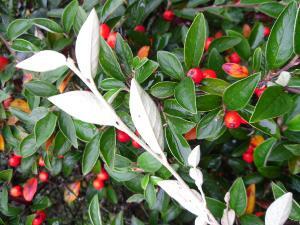 Shrubs can be either deciduous or evergreen. Bupleurum fruticosum is commonly known as Shrubby Hare's Ear. 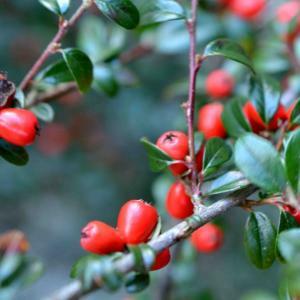 An evergreen shrub of bushy habit up to 2m tall. A simple obovate blue-green leaf. 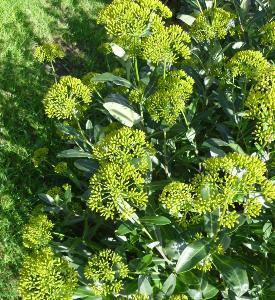 During Summer and early Autumn it produces clusters of tiny yellow flowers. Grow in full sun in a well drained soil. 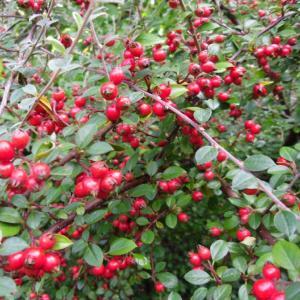 Cotoneaster conspicuus is one of the most valuable of the smaller shrubby species as regards both flower and fruit. 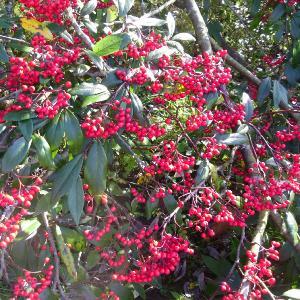 The berries are not attractive to birds and usually persist on the bush throughout the winter;the same is true in its native Tibet, where Frank Kingdon-Ward saw bushes still covered with fruit in mid-April.